With more than three fourths of its borders surrounded by water bodies, India dawns the surrounding ocean like a pearl necklace. Thus an estimated 7,000 kilometres long coastline of India is dotted with some of the most alluring beaches in the world. All these beaches are exotic and have a unique geography, rich with history, unique stories to tell, and are also cultural hubs. 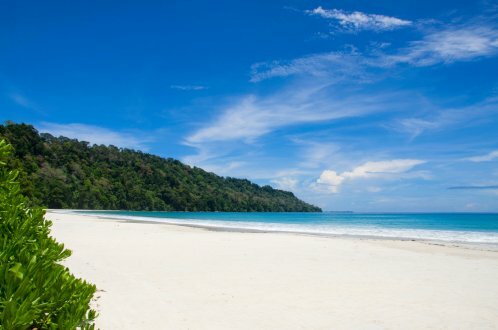 Offering something different from each other, you must surely explore some of these unusual beaches in India which exhibit a unique characteristic that cannot be found anywhere else in the country. 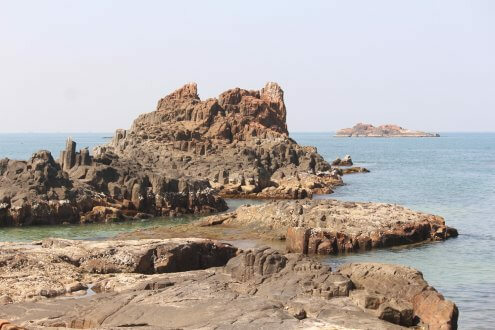 The Virgin reefs of Bangaram are truly unique for any nature lover. It makes you one with nature, boasting an astounding spectacle of sparkling coral reefs, the infamous silvery beaches, and blue lagoons. The bio luminescent beach is the centre of attraction here. Bangaram beach is popular for the bioluminescence phenomenon, which occurs due to the phytoplankton activity at night. The blue light emission from these result in the illumination of this sea making it look like an extraordinary sea of stars. 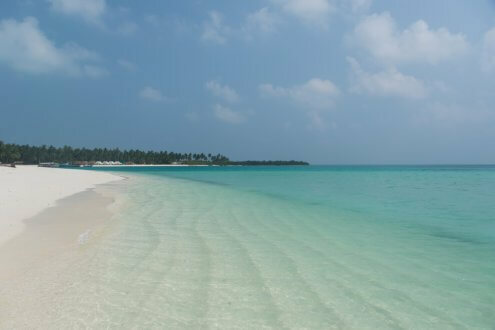 Words cannot describe this stunning sight to behold.Located in Lakshadweep, this unusual beach in India is just an hours' flight from Cochin, Kerala's capital. Dhanushkodi is an exotic beach where reality overlaps with mysteries, miracles and myths. 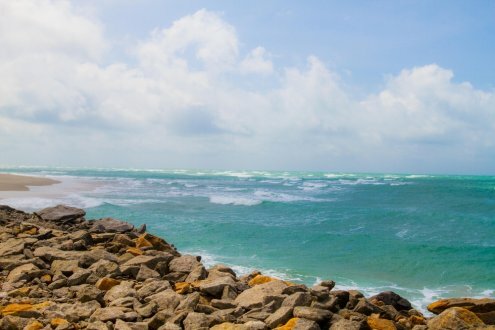 The name Dhanushkodi refers to a ghost town and has interesting stories to whisper. Once an epitome of civilization, Dhanushkodi was connected to Rameshwaram by rail until 1964 when she was devastated by a ravaging cyclone. What stands today are the remains and ruins of this great tragedy and this is what makes Dhanushkodi a unique experience. Do not let the calamity-stricken back story deter you from experiencing this quirky beach. The wrecked railway tracks, battered boats, relics of Rama Setu and the exhilarating drive through the shallow beaches make up for an unforgettable and soulful experience. You can get to Dhanushkodi via a direct drive from Rameshwaram, Tamil Nadu. 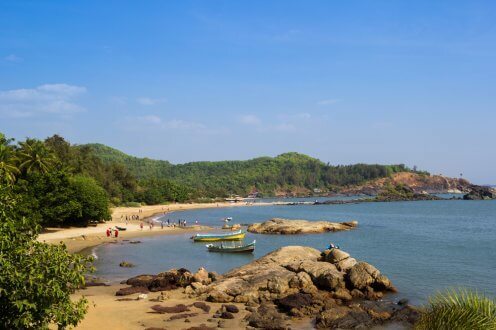 Arambol, also known as Harmal beach, is a secluded beach situated in North Goa. 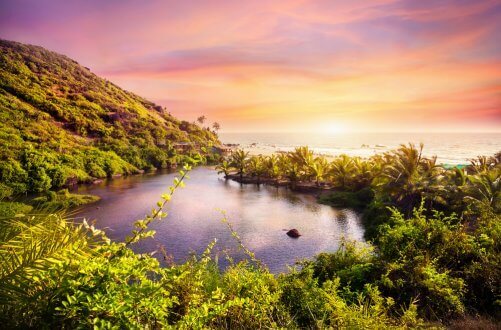 It is one of the must visit Goa beaches and also among the most unusual beaches in India. The astonishing fact about Arambol Beach is that it is the only beach in India where one would find a sweet water lake that extends along the bottom of the valley into a thick jungle offering a picturesque view. Officially named Vagkolam, the lake is fed by boiling hot springs and is lined with sulphurous mud and mud-smeared hippies basking in the sun. Compared to the popular beaches of North Goa like Baga, Calangute and Anjuna, Arambol Beach offers a peaceful and tranquil experience. Besides a relaxing walk and dolphin watching at the beach, visitors can also go in for paragliding and other water sports. The nearest airport to Arambol is the Dabolim Airport from where one can hire a taxi. Welcome to one of the most eccentric beaches of India, the St. Mary's Beach with a rather interesting nickname - the Coconut Island. What makes her more exotic and an unusual beach in India is the Island brimming with Palm Trees in its Perimeters with feral goats, shores rich with seashells and its most unique feature - basalt rock columns. These mammoth-sized crystallized rocks formed by volcanic activity are scattered throughout the island making it a sight not to miss. It seems as if nature was the one building a fortress of solitude for the soul searchers and the wanderers. Located in St. Mary’s Island, Malpe, Karnataka, this Island is only accessible through water ferries from Malpe Beach. Nearest airstrip is that of Malpe-Mangalore airport and the nearest railway station is that of Udupi Junction. Muzhappilangad beach in Kerala is unusual as it is the only drive-in beach that stretches to about 5-kilometres along the infinite ocean as far as the eye can see. 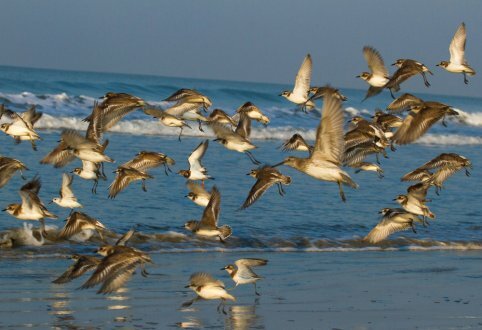 It runs parallel to the National Highway 66 and is the longest beach in Malabar. If you take your wheel for a spin perpendicular to the unending waves, you get a view of Dharmadom Island and the fishing boats rocking on the sea. This beach also offers paragliding and parasailing and is perfect for shallow beach swimming, as the steady black rocks make the beach safe devoid of any deep currents. This beach has been cited amongst the top 6 driving beaches in the world by BBC. Located in Muzhappilangad, Kerala, the nearest airport is Calicut airport and the nearest railway station is Thalassery Railway Station. 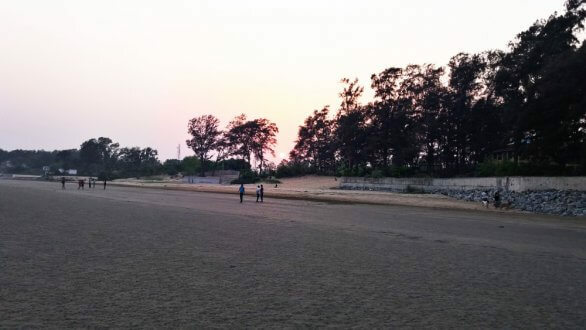 Chandrapur Beach is an exceptional vanishing beach which is also known as the hide and seek beach.One of the best and unusual beaches in India, here the sea retreats 5 to 6 kilometres every day during low tide and then restores itself during high tide. This unique phenomenon takes place twice a day. The magical vanishing act of this miraculous sea is something not to skip and is a jaw-dropping spectacle. When the sea retreats, you can walk deep into the sea beds. The white sand and casuarina groves add to its beauty. Rare varieties of crabs can also be found crawling around the shores. 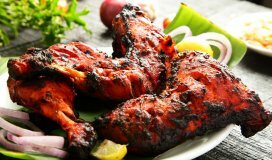 Located in Balasore, Odisha, the nearest airport is Kolkata Airport and the nearest railway station is that of Balasore. The beach that has the symbol of all vibrations etched in its façade, the "OM" beach forms contours that resemble the spiritual insignia making it a unique and unusual beach in India. This vibrant and happening beach has innumerable cafeterias lined on the beach.With a plethora of activities like jet skiing, trekking along the coastline, dolphin watching, and visiting old and prehistoric temples among others, you can also just walk around the beach as it offers incredible picturesque views. 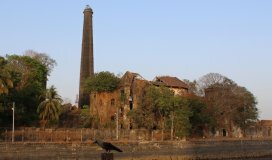 Located in Gokarana, Karnataka, the nearest airport is Dabolim Airport and Ankola is the nearest railway station. Often cited as the prime attraction of Diu,the Nagoa beach has something unique about its vibe. It is lined with rare Hoka Trees which cannot be found anywhere else in the Country. These African Trees were planted in numbers during the Portuguese era. These rare trees are said to be sacred. Nagao beach also has a unique crescent-like shape, an exotic ambience, incredible scenic beauty, white sands, and is characterized by an enclosing cove of blue water, which can be visited all throughout the year. You can also pursue activities like parasailing, windsurfing, water skiing, and jet skiing or engage in recreational activities like camel or pony rides. Located in Diu, Daman and Diu, Diu airport is the nearest airport and Veraval is the nearest railway station. Located in Devgad, Maharashtra, the breathtaking panoramic views of Kunkeshwar Beach will refresh your tired nerves. You will surely love this clean and unpolluted beach. Here you can swim in the clear water and even get to view the dolphins far away if you are lucky. Coconut and mango trees on the beach make everything all the more beautiful. You can also visit the popular Kunkeshwar Temple i.e. an ancient Shiva Temple located in Kunkeshwar village that is 14 km away from the beach. 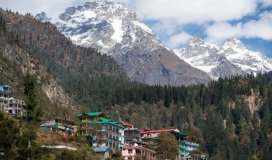 The initial winter months is the best time to visit Kunkeshwar. 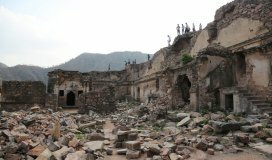 Visiting this spot immediately after the monsoon showers is also a great idea. Dabolim airport is the nearest airport and Nandgaon, though 45 kilometres away, is the nearest railway station. There are also several state-run buses that connect Kunkeshwar to major cities. 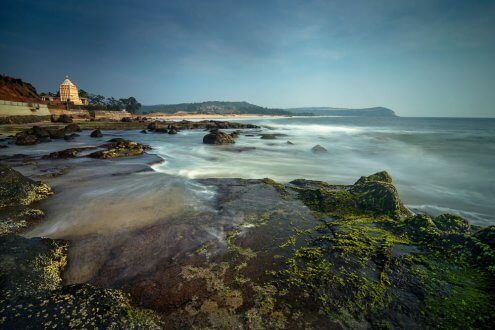 Offering a mesmerising aura of serenity and calmness, these amazing unusual beaches of India are a major tourist attraction.Each of them is special in its own way. If you wish to indulge in a natural and adventurous endeavour, these beaches will surely offer you an unmatched experience.